The massive government/financial sector fraud and coercion that caused the crash of 2008 as well as the ongoing recession still remains largely uninvestigated and entirely unprosecuted. Bernie Madoff’s fraud is not only small by comparison, it is not even relevant to the real causes, which still exist. 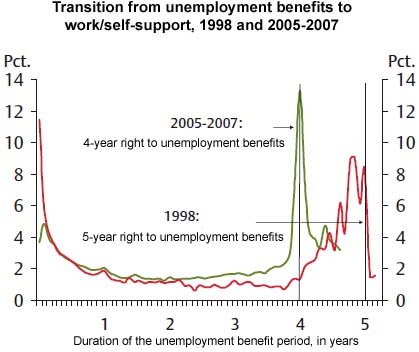 However, let’s look at one side effect in this article – unemployment payments. If you care about someone, you don’t punish their success, and you don’t reward their failure. Paying tax dollars to people who fail to find a new job rewards their failure, and taxing people who successfully find or maintain employment punishes their success. Not only does paying tax dollars to a person who fails to find a new job reward that failure, but it also tends to reduce their skills and obsolete their skills as they remain unemployed longer – because we paid them to remain unemployed. Paying a person to remain unemployed also tends to weaken that person’s character, which is a really mean thing for us to do. Not that anyone in government or the mainstream TV media cares, but the US government has no Constitutional authority to pay people for not working anyway. On the other hand, some of you may have experienced what another person told me, “I could probably find a job, but I’ll start looking for a job when my unemployment benefits run out. Then I’ll move to where my mom lives because she only has about two years left. I thought I was going to move near mom and get a job a few months ago, but then the government extended my benefits.” That was in the summer of 2010. Benefits were extended again after that, and now they just got extended 13 more months. Now this was reported in the New York Times, so every Democratic Party leader knows this. Nevertheless, Nancy Pelosi, citing the government accountants at the CBO, claims that unemployment benefits create jobs and improve the economy better and faster than anything else. The Democratic Party leader and Speaker of the House, Nancy Pelosi. Unemployment benefits do create more jobs – IN CHINA. Unemployment benefits borrow from our children to create jobs in China and other countries. If the government and the Democratic Party were serious, they would punish the ongoing government/financial sector fraud and coercion that created the unemployment, and they would coordinate unemployment benefits with mechanisms that motivate people to find jobs as soon as possible. I can see why politicians would want to avoid these smarter policies, as long as the media lets them, because these policies would require genuine skill and would also be vulnerable to corruption. Therefore, these politicians know themselves well enough to know they couldn’t pull it off. It would be much less embarrassing for them to simply hand out checks. If the government and the Democratic Party were serious, they would give a tax break to companies that added jobs – IN AMERICA. The tax break should be proportional to the the salary of the added jobs because if the amount were the same for any new job, then a company would add three $20,000/year jobs instead of one $60,000/year job. The CBO analysis only considered the stupid option of giving a flat non-proportional tax break to companies for each added job, and thus rejected this option in favor of handing out checks to anyone not working. Of course, what the Democrats and the media don’t tell you is that the Democrats requested this analysis, and whoever requests an analysis from the CBO can set the parameters of what options will be considered or excluded in the analysis. For example, the Democrats obviously instructed the CBO to not consider whether the jobs will be created in China, and to only consider a flat tax break for added jobs. VERY SNEAKY – or maybe they’re just really incompetent. What about me? I don’t sell out – not even when I am unemployed – not even when everyone else is doing it. One employer, Digital Focus, laid off a third of its employees, including me, and they offered each of us $3,000 if we would sign a statement that we would never say anything about that company or its current, former, or future employees. This was the dot-com crash; nevertheless, I was the only one who declined. I was eligible this and two other times to collect unemployment, and one of those times, I was forced to eat hot dogs and ramen noodles, and I was weeks away from being forced to sell my house, but not once have I ever collected money for not working. 1) Ok, you nailed Pelosi pretty good. 2) It does not make sense to blame media. Media voices lots of different opinions. 3) "$3000 for silence about company" is not the same as unemployment benefits. OK, I think I made those a little more clear now, so thanks, but those are minor points, what did you think about the main points? this whole post is missing the political point, it is naive and doesn't address the real issue; how long will it take for the powerful voting block of the recently employed to forget that the government rewarded failure in the banking system by taxing the bottom 99% percent of society through massive inflationary policy (and somewhat insignificantly, increased taxes). the governments answer is 99 weeks. that is the point. your post is sophmoric , dated, and a broken record, regardless of how 'correct' it may be regarding fiscal employment/unemployment effects. All you're saying is that although I am correct, you're angry that I limited the scope of this article to the usual effects of unemployment benefits when I could have blown the lid off of the whole financial/government fraud.